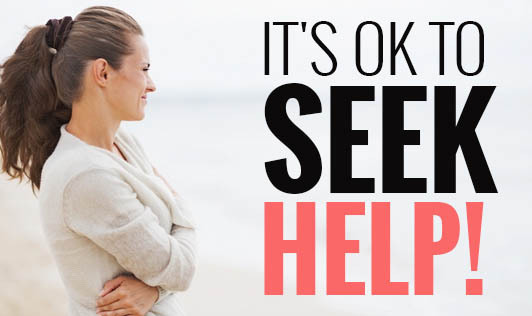 It's ok to seek help! Your body signals, inner-felt senses, and emotions send messages to you to see a counselor. You don't feel your regular self, your concentration may have diminished and you probably feel confused. This is preventing you from functioning at your optimal level, you're having disturbed sleep and your eating habits have changed. Not wanting to show that you're facing emotional turmoil can cause you to refrain from asking for help. There are strong misconceptions about counseling that one has either seen on television or in the movies or heard from people. Similarly, even the cultural messages about counseling stigmatize mental health care. While there are few who may get past the negative messages about counseling, there are still many people who may postpone receiving the help they may need to overcome some difficulty in their lives. Statements like, "Don't tell everybody that your seeking help" or "That is so not cool", that you might have heard from your friends and family members may have prevented you from seeking help. You might have even told yourself things like "everybody is going to think I'm crazy", "what if they find out" or "I can handle it on my own". The truth is, seeing "counseling" as a sign of weakness is often a very entrenched pattern of thinking, but once you're ready to recognize that you're unable to handle it all on your own and you need unbiased help that you can't receive from your friends and loved ones, counseling can be the best solution for you. Seeing a counselor can be a big step, it's normal to feel anxious. But you're not alone, many people of all ages and backgrounds see counselors for a number of reasons. Whether it's just a simple issue such as having trouble prioritizing to a relationship breakdown, counseling can help you deal with and overcome issues that are making you feel uncomfortable or causing pain. Counselors will help you find your own insight and understanding of your problems. Note that in most situations, unless you say so, counselors have to keep whatever you tell them confidential. Remember that seeking help is a sign of "STRENGTH" and, not a sign of weakness!